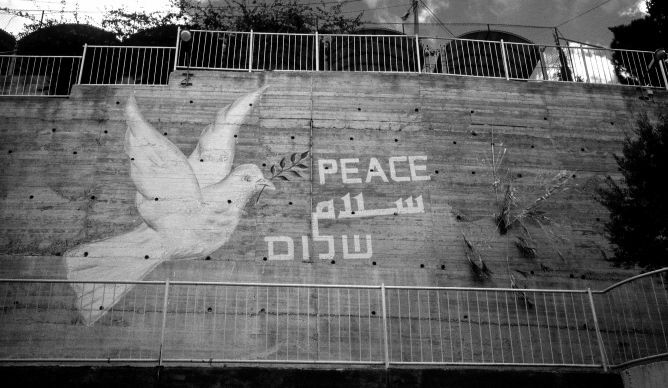 A mural promoting peace in three languages, English, Arabic and Hebrew, adorns a wall outside the Mar Elias Educational Institute in Ibillin, Israel. Two United Methodists are urging people on July 15 to fast and pray for peace in the region. The United Methodist General Conference, the denomination’s top lawmaking assembly and the only body that can speak for the church, has adopted a number of resolutions regarding the Israeli-Palestinian conflict. The following are in the 2012 Book of Resolutions, which include the denomination’s teachings on current social concerns. Resolution 6111. Opposition to Israeli Settlements in Palestinian Land. The United Methodist Board of Global Ministries and Ginghamsburg Church in Tipp City, Ohio will hold the “Walking with Palestinian Christians … for Holy Justice and Peace” conference on Aug. 7-8. Workshops will focus on biblical/theological perspectives; pilgrimage and presence; political, economic and social advocacy and actions; and involvement and positions within The United Methodist Church. The deadline to register is July 30..
Thomas Kemper, the top executive of the United Methodist Board of Global Ministries, shares that sentiment. The denomination’s mission agency and Ginghamsburg Church, a United Methodist congregation in Tipp City, Ohio, will hold a conference in August on “Walking with Palestinian Christians,”focusing on people who are often caught in the crossfire of the conflict.